In 2014, Marlene Mendoza and Elsa Foley were young mothers working long hours as engineers at Nissan. "We were always sleep deprived and anxious that we would leave something in the back seat," Mendoza said. Collectively, their hearts broke for every story they heard about children accidentally left in cars. They wanted to figure out a way to help, and began brainstorming. At the end of a long day after work, Mendoza placed a pan of leftover lasagna in the back seat and then drove home and gave her child a bath, leaving the food overnight. The next day, the smell inside the car was overpowering, and it helped her realize the potential. Rear Door Alert was born. The solution turned out to be as simple as harnessing the power Nissan vehicles already had: door sequence logic. For instance, if you forget to shut your trunk or don’t close a door all the way, the car will beep and/or flash a display on your dashboard to let you know. The way door sequence logic works, in the case of Rear Door Alert, is that it monitors the rear door switches to detect open/closed status before and after a trip. 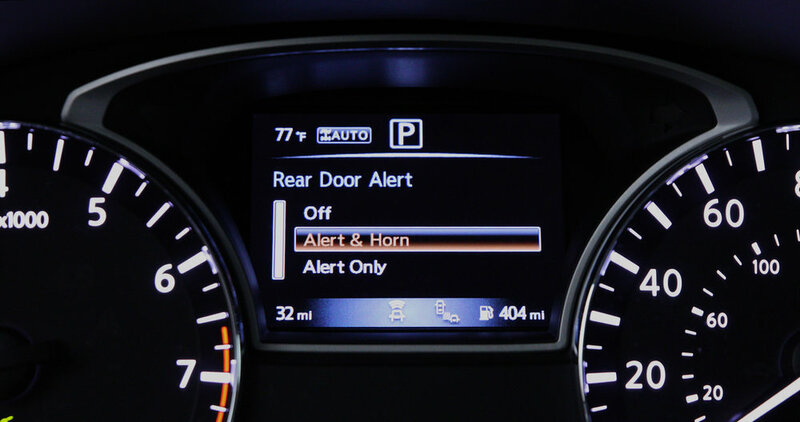 If the system detects that a rear door was opened/closed prior to a trip, but then was not re-opened again after the trip was completed, the car alerts the driver. The series of notifications begins with a display in the instrument panel and progresses to distinctive chirps of the horn. Since they were leveraging already-existing technology, that made it easier to implement. Nissan chose the 2018 Pathfinder to offer Rear Door Alert first, because it’s one of the most popular name plates for families. The Altima and the Rogue will launch this fall with RDA. For 2019, the manufacturer has added eight more vehicles; by 2022, the plan is for it to be in all models. The best time to add RDA is when a new model launches, says Mendoza. Now, Marlene has three boys, and has been with Nissan for six years. She is proud of this technology and hopes other companies will implement something like it in the near future to protect as many children and animals as possible. Maybe it's just a gallon of milk on the floorboard behind you you don't want to forget. Maybe it's just a hostess gift you left on the back seat. And maybe the alert will help you or someone you know save something even more precious. If you’re in the market for a Nissan with Rear Door Alert, you’ll be glad to know that it’s standard technology and will not add any cost to the vehicle. Owners may opt in to turn the system on, and once it’s on, you can leave it or turn it off as needed.